The Miami Dolphins scandal exposes allegations of bullying, hazing, and racial slurs. 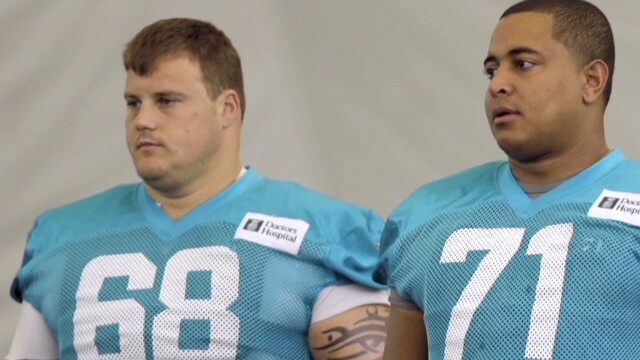 Suspended NFL player Richie Incognito said his alleged bullying of Miami Dolphin teammate Jonathan Martin is misunderstood because "people don't know how Jon and I communicate to one another." Martin quit the team because of "harassment that went far beyond the traditional locker room hazing," his lawyer says. Was a line crossed? Does the NFL need an anti-hazing policy? In the Crossfire, sports columnist Christine Brennan and former NFL player Jamal Anderson join hosts S.E. Cupp and Van Jones to debate. We want you to weigh in. Vote by tweeting with yes or no #Crossfire or comment on our Facebook post. View results below or through our Poptip results page if you are on a mobile device. You can find strength in numbers and you can beat the feeling that you are alone or that you deserve to have someone bully you by sharing your struggles with other people. Learn to get in touch with the silence within yourself, and know that everything in life has purpose. There are no mistakes, no coincidences, all events are blessings given to us to learn from. Everyone who wants to do good to the human race always ends in universal bullying.If someone bully you Do you want to know who you are? Don't ask. Act! Action will delineate and define you.Keep safe and be alert always no one deserve to be judge check this out at http://safekidzone.com/#!/page_home.
. I wish people could accept others for what they are , not for what they aren't. Stop Bullying, words hurt! We all have flaws in the end, so think before you speak, maybe you can save a life! -Dedicated to all the victims of bullying around the world, speak up!Be a friend and dont pull someone down. You will never reach higher ground if you are always pushing others down.Those people who think they know everything are a great annoyance to those of us who do.Bullying? Be Smart, Don’t Start keep safe bring protection with you at http://safekidzone.com/#!/page_home. This discussion was absolutely ridiculous. Asking if such "locker room behavior" is affecting our children. How do our kids, or us for that matter, know what goes on in professional team locker rooms? And what business is it of ours? These are grown men playing a game for a living and making a lot of money doing it. They "attend" universities, graduate with virtually no education, only play for a few years before they are permanently injured or replaced by the new crop, and spend the rest of their lives trying to make a living while suffering from debilitating injuries. What they say to each other in a locker room is none of my business. Whether they treat each other with respect is no concern of mine. Are you kidding me? Bullying happens everywhere, not just the NFL. It happens in Manhattan offices, hospitals, basically anywhere there are people. If someone is making racist remarks about you and threatening you with physical harm, it is definitely a cause for alarm. Whatever happened to protect the weak? My 10 y/0 daughter came into my TV room and stood watching the game waiting for a break to speak with me. Watching the game, she said to me:"Are those grown-ups." When America decided to call it "Professional Football" thats when the public, owners, and coaches should have demanded the players act professionally!